I’ve lived in Oklahoma for over a dozen years now and the only reason I ever find myself in Tulsa is because of music. Honestly 9 times out of 10 it’s for a concert. Ironically, it’s never really been for the current Tulsa music scene as much as rising or well-established indie acts, which feels like terrible oversight on my part, but that could change with the inauguration of a new music festival called Center of the Universe Music Festival. Before you assume that’s very conceited of Tulsa, I would like to point out there is a legit reason they chose that name. There is a neat audiological phenomenon called Center of the Universe down there in The Brady Arts District. Ok, so I myself have never experienced this thing…. But it is said if you stand in this one spot, which was constructed by pure chance during a street renovation, you can hear echoes in any direction you face. What else is weird about this echo-y location? Only you can hear this echo. So is this what sonar feels like? Maybe? I don’t know. But it is one of a few points of interest surrounding the festival. Another is that organizers Philip Kaiser and Chris Lieberman decided to bring back the kind of music festival that Diversa Fest (D-Fest) used to be. Chris Lieberman said that hosting a huge production like a large scale music festival, while meant to put Tulsa back on the music festival map, is also a great opportunity for people to come to the city and get some cultural exchange. It’s no secret that Oklahoma is a driving state. Its cities are spread out and sometimes it can feel like you’re cut off from the growing diversity in other parts of this state if you don’t get out to explore very often. If you’re out of the loop a bit, there’s been some new development happening in Tulsa. A few Oklahoma City artists and those familiar with Oklahoma’s art scene can tell you about the new Hardesty Art Center, also in the Brady Arts District, but there’s also the new Woody Guthrie Center that just opened this year too. Music and art all in one spot during a two-day weekend of music festival highlights? If this prospect excites you, then Tulsa might be your weekend adventure if you’ve been jonesing for an event of this sort since Norman Music Festival. Another point of interest was the tiny side conversation I had with press contact Ashely Fuller. We’d been talking about Oklahoma’s music festivals. Fuller moved back to Tulsa after a 5 year stint in Austin. She said at first she was a little depressed about the lack of festivals happening in Oklahoma on a regular basis, especially in the Tulsa area. The funny part is just this year alone, not only is there the Center of the Universe Music Festival springing up, but there was the much smaller, but also set to become another recurring festival called Tulsa Music Festival. Center of the Universe is different in that it doesn’t have the same philanthropic component as the Tulsa Music Festival and is a lot larger, but Fuller said it was encouraging to see demand and support come together. People clearly want these events, and Tulsa stakeholders are doing their best to meet that demand for further development and growth by actively revitalizing places like the Brady Arts District. okc.net: Tell me about the decision to put on this music festival from conception to execution. Phil Kaiser: Ever since the demise of D-Fest a few years ago, Chris would say to me periodically: “Tulsa really needs to have a large-scale music festival; we should put one on.” To which my reply was invariably: “Yeah, right! Like I have time for this.” However, with the tremendous growth in the Brady Arts District over the past year, and the excitement this has generated, the time was really ripe for an event like this, produced by Tulsans, for Tulsans, that would capitalize on the enthusiasm already building in the neighborhood. So last November we began making plans to implement it. It was important to us to include as many local partners as possible, so we began by approaching businesses in the Brady Arts District to get their buy-in and participation in a project that would benefit all of us. okc.net: Have either of you participated in hosting a music festival before? If so, what were some of the lessons you took away from that experience? Phil Kaiser: Neither one of us has hosted a music festival before. We consider ourselves apprentice music moguls. Chris is founder and CEO of Tulsa’s Route 66 Marathon, now in its eighth year, so he brings his experience and expertise to producing a large-scale event like this. okc.net: Are you modeling this free festival on others that have been successful, if so which ones? Phil Kaiser: We are not modeling this festival after any specific existing event. It is important to us that this be something unique to Tulsa. okc.net: I noticed there was another music festival, Tulsa Music Festival, that started this year. That event happened at the end of May, but I am curious if you were aware of each others efforts, and in what way the two music festivals plan to be different? I know the Tulsa Music Festival had a philanthropic component for a charity it supported, but that’s not the sense I get about Center of the Universe, which seems like a music festival for the city of Tulsa. Phil Kaiser: Tulsa, and specifically the Brady Arts District, has been a hub of live music for 100 years. There are many music events going on here almost every week. The festival you reference is much smaller in scale than what we are doing, and featured local bands exclusively with proceeds going to a local charity. Our mission is slightly different: We aim not only to support the local music scene, but also to bring in national and regional acts and expose them and their fans to everything Tulsa has to offer. There is a tremendous excitement in downtown Tulsa now. The recent openings of the BOK center, OneOk stadium and Guthrie Green in this area, which already included such historic venues as the Cain’s Ballroom and the Brady Theater, have provided the necessary momentum to spur the addition of dozens of new restaurants, bars, live music venues, boutique shops and art galleries which are already drawing thousands of people here every week. Our goal is to continue to build on this momentum and help to make downtown Tulsa an attractive place to live, work and play. 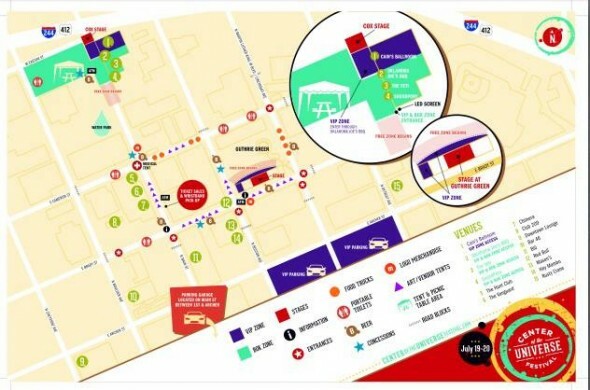 okc.net: While Tulsa Music Festival wasn’t aiming to replace D-Fest, I’ve read that you both went into the planning of Center of the Universe Music Festival with that intention. What parts of D-Fest do you miss, and what if anything from that previous festival are you hoping to bring back? Phil Kaiser: D-Fest was a great event for Tulsa, and when it went away a couple of years ago it left a definite void. D-Fest proved that Tulsa supports the idea of a large-scale music event here. We plan to bring this back and grow it even bigger. okc.net: I read in Urban Tulsa Weekly that this festival hinges on having 10% of those who can afford to buy VIP options foot 60% of the cost of hosting, have you seen this work before, and more importantly, do you think Tulsa and surrounding areas will see 10% the 20,000 estimated festival goers step up to purchase these options? Phil Kaiser: Tulsa is lucky enough to have a very engaged and generous corporate and philanthropic community, as well as a solid core of individuals who are serious about live music and about Tulsa and who will buy VIP and BOK Zone tickets in order to enjoy a premium experience (and air conditioning!). Between these groups, we are confident we will sell a sufficient number of tickets. okc.net: What was the thought process in choosing bands, I’ve seen where they can apply, but how is the selection made, is it by committee? Phil Kaiser: We assembled a committee of local music people, including artists and promoters, who screened all the bands that applied to play in the many bars, restaurants and music venues in the BAD (the $10 application fee benefits Tulsa Pubic Schools for music programming). Their mission was to select a talented, diverse mix of artists and match them to the appropriate local venues who are partnering with us for the festival. okc.net: One assumes since you’re taking on the planning of a music festival, that you’re likely big fans of music. With that in mind, did you have specific bands you were hoping to secure on the line up? Phil Kaiser: We really wanted to get OneRepublic because 1) They are great, and 2) their lead singer, Ryan Tedder, is from Tulsa. They will be kicking off their new tour at our festival, which is very exciting. okc.net: Just for fun, what would your dream headliner line-up look like? Phil Kaiser: Jimi Hendrix, The Doors, The Beatles, Bob Marley and Janice Joplin. okc.net: What haven’t I asked that is important to know about the Center of the Music Festival? Phil Kaiser: Our overarching objective with this festival is to create an event that accomplishes several objectives simultaneously: direct economic benefit to the local economy in the Brady Arts District and downtown Tulsa; promoting a sustainable public transit system downtown that could help to wean Tulsans from reliance on their cars and encourage a denser, greener urban environment; attracting creative types to Tulsa by doing cool stuff like this and making this an even greater place to live and work; and, ultimately, to facilitate the establishment of programs and facilities to secure Tulsa’s rightful place as a hub for music and art. You know when you think about it, Tulsa and Oklahoma City music loving artsy types are pushing for the same kind of change as everyone else interested in sustainable urban revival. 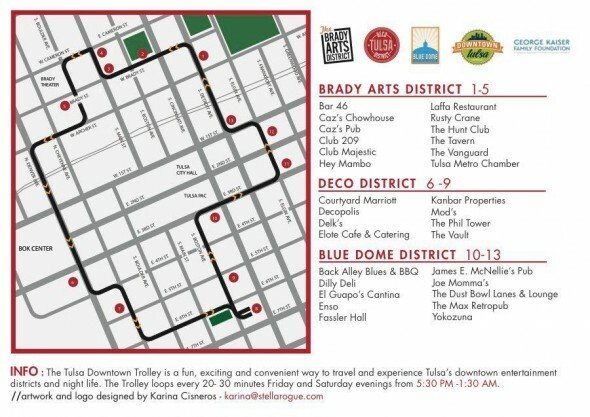 This weekend would be a good time to check out Tulsa’s progress during the festival, which is free to attend this weekend from July 19th to July 20th. There are VIP options which you can check out here. While you’re on their site browse the line up, and don’t forget a lot of Oklahoma musicians and bands will be on there too. If you’re curious about the peeps on the line up here is a “Center of the Universe Music Festival” mix in no particular order of acts, headliners and others, that have songs posted on SoundCloud. By no means are these all the artists, but if you’re driving from OKC to Tulsa I’ve got your first 1 and 14 minutes of drive time covered. You may need to be on the Soundcloud website to enjoy it tho, as someone or a few haven’t made their tracks available for streaming on the widget and the app. Tagged bands, Brady Arts District, Center of the Universe Music Festival, festival, Mixtape, music, okc.net, Phil Kaiser, Soundcloud, Travel, Tulsa, Tulsa Music Festival. Bookmark the permalink.